Up this week are brief reviews of three useful websites for musicians. In a previous post, I mentioned Toggl as a great tool for tracking and managing practice sessions. I’ve been using it more or less every day for the past several months, and still highly recommend it! In addition, check out the following sites to help plan and accomplish your practice goals. Random.org: This is probably one of the most underrated websites around, with lots of potential applications for musicians. It doesn’t have many bells and whistles, but is stable and does exactly what it advertises. One of my favorite tools is the Random List Generator. To use, simply copy and paste text into the box, and it will generate a randomized list. 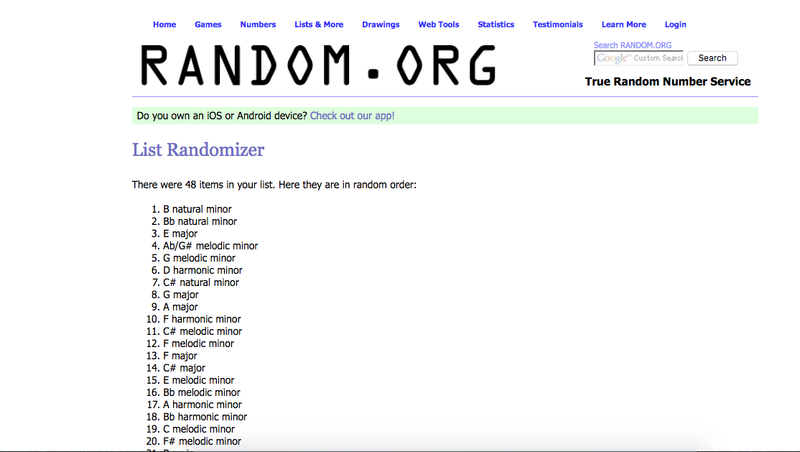 For example, copy and paste all 48 major and minor scales (click here for a PDF), hit the “Randomize” button, and off you go. To generate a new, completely random list of the same scales, just go back and do it again. Practicing excerpts for an audition? Copy and paste them into the box to create a random order. (click here for a PDF list of several common excerpts). I also use the random number generator in lessons to pick out sight-reading examples. These are just a few of the ways you could use Random.org to make your practice sessions more effective, efficient, and fun! Let me know in the comments if you come up with others. Trombone Tools: David Vining of Northern Arizona University and Mountain Peak Music has put together a fantastic collection of videos and articles. While some of them are obviously geared towards trombone players (Alternate Positions, for example), a majority would be useful for all brass players. His pages on Breathing, Lesson Guidelines for Students, and Hesitant Entrances are great places to start. Don’t Waste Your Time Practicing! This new website was created by Dr. Travis Bennett, Associate Professor of Horn at Western Carolina University. Though still in the early stages of development, the site looks very promising. The title of the page is taken from a presentation Dr. Bennett has given on the topic of efficient practice, available on YouTube and embedded below. I look forward to seeing this new resource take shape.